I have been posting for the theme auction that starts today at Mineral Auctions . The theme is historic mines in North America. It was a very enjoyable research for me and although I read about several mining districts on all parts of the US. Canada and Mexico, I will only mention on a couple Copper Mines and at a later date, may come back and write about other locations like Gold in California and Silver in Mexico. This chart shows recoded mining activities in the Americas in general. As you can see, the start of the mining boom in the U.S. was in the 1800's. Calumet: The first englishman to visit the Michigan Copper Belt was Alexander Henry. He remained there for several years after his arrival in 1765. In his correspondence he reports the discovery of masses of virgin Copper weighing several tons, laying detached upon the surface. He mentions a mass of ten tons which he thought may have rolled down a hill. He went back to England in 1770 and founded the first company ever organized for mining Copper in America. Henry returned to the mines with two companions but they never got farther west then Quebec, where their effects were seized and sold for debt. They were never seen again. There were various other explorers that described the area in a similar way. A lot of studies were made, but practical mining only began in 1844. In 1867, a man called Alexander Agassiz, took over the management of the Calumet and Hecla Mines. Later they were consolidated as the Calumet and Hecla Mining Company. The year of 1898 was the most prosperous ever known in the Copper districts of Lake Superior and both owner and employees, which by then were 10,000 were making a lot of money. Their production in 1898 was 90 million pounds and the shares were soaring at the Boston Stock Exchange. 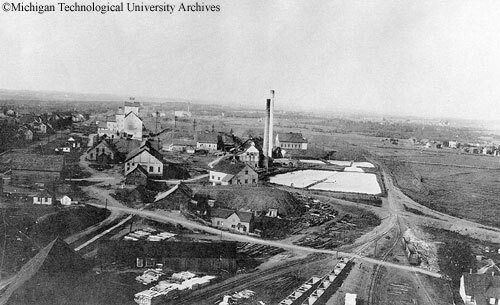 The Quincy Mine is an extensive set of copper mines located near Hancock, Michigan. 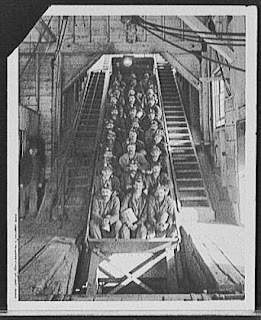 The mine was owned by the Quincy Mining Company and operated between 1846 and 1945, although some activities continued through the 1970s. 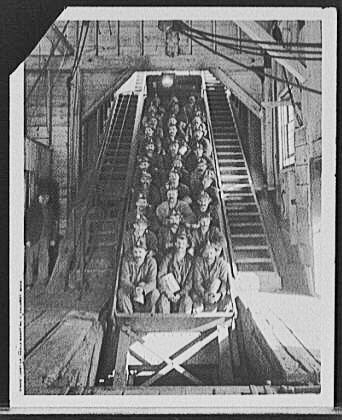 The Quincy Mine was known as "Old Reliable," as the Quincy Mine Company paid a dividend to investors every year from 1868 through 1920. The Quincy Mining Company Historic District is a U.S. National Historic Landmark District. Quincy Mine was at some point the leading Copper producing mine in the U.S. It was exeeded by Calumet and Hecla in 1867. The Quincy Mining Company closed operations (but did not dissolve) in 1931 due to low copper prices. During World War II, the mines re-opened due to increased copper demand. When the government stopped supporting copper prices after the war, the mines quickly closed for good. I have a few Calcites with Copper inclusions from Quincy Mine. As a coincidence, we have been watching a documentary made by Ken Burns: The National Parks: America's Best Idea . It was aired by PBS but we got them through Netflix. There are 6 discs of almost 2 hours each, so once every other day, we watch one. I must say it is one of the most beautiful and moving documentaries I have ever seen. The coincidence is that the National Parks started to be created around the same time that mines were being discovered and implemented and sometimes arose conflicts of interest. The documentary shows the railroads being constructed. The railways that would take ore and lumber across the country. I highly suggest this documentary. It shows the greatness of men and nature. A greatness that we probably miss. But still gives us hope and makes us proud. Men that dedicated a lifetime for a cause and sometimes all they owned to preserve places that otherwise might have disappeared. All with the future generations in mind. A gift. For us. How interesting that your first "rock" blog pertains to some Michigan mining history since I live in Michigan! I found it fascinating especially since much of what was said was unknown to me even though I live here. Our mutual friend (mwminerals) is probably as well versed on Michigan mining history as anyone besides yourself. I THINK I linked some of my colored stone files for you to view. Of course, my absolute favorite USA locale is the Stewart Mine. Thanks so much for making Michigan FIRST in what I hope is many blogs on mining/rocks/gems!